A UN-backed mechanism to curb carbon sequestration and ensure biodiversity conservation, REDD+, is compromising community rights. Is there a better way? One may call it a huge leap of faith. In December, when the world leaders meet in Poland to finalise the rulebook of the Paris Agreement, a document that governs global climate action starting 2020, they will enshrine in it a mechanism over which the dust is yet to settle. The mechanism of REDD+, short for Reducing Emissions from Deforestation and Forest Degradation, where “+” stands for conservation and sustainable forest management, provides financial incentives to communities, regions and countries for keeping their forests intact. The rationale behind the mechanism is simple: forests lock up a lot of carbon. Going by The Economics of Climate Change, a 700-page report by economist Nicholas Stern in 2006, deforestation contributes more to global emissions of greenhouse gases (GHG) each year than the transport sector. So halting deforestation is an immediate and highly cost-effective way to curb GHG emissions. But the fundamental fear is that to achieve its environmental objective, REDD+ will impose restrictions on communities who depend on forests, especially those with insecure land tenure, and encourage evictions from forests. There are also doubts whether the mechanism, elaborated in just two paragraphs in Article 5 of the Agreement, would adequately compensate these communities for forgoing deforestation, which they rely on for subsistence and livelihood earning. In 2007, when REDD+ was formalised at the 13th United National Climate Change Conference in Bali, dubbed COP13, the cost of compensating forest users for forgoing deforestation and degradation—referred to as opportunity costs—was a distinguished feature of the mechanism. It was estimated that the opportunity cost of forest protection in eight countries, responsible for 70 per cent of the emissions due to deforestation, was some US $5 billion a year. A decade later, direct payments to forest stakeholders remain rare, and there is a global recognition that the implementation and operational costs of REDD+ are much higher than initially expected. Concerns about community rights are also growing. As the implementation of REDD+ graduates from small projects to large-scale programmes, the mechanism has moved the goalposts and the opportunity costs have stopped appearing in REDD+ discussions. Jutta Kill, a Berlin-based researcher, says REDD+ is now looked upon as a mechanism to address the drivers of deforestation and forest degradation, instead of compensating for opportunity costs. These fears are not unfounded, suggests a recent analysis by Delhi-based Centre for Science and Environment (CSE) whose researchers have visited REDD+ projects in Kenya, Tanzania and India to assess the ground situation. 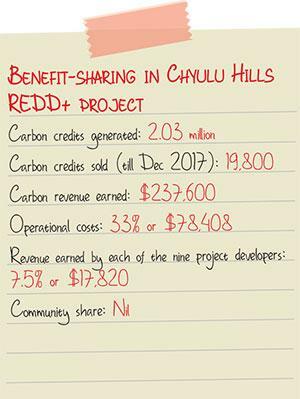 Spanning 410,534 hectares (ha), the Chyulu Hills REDD+ project in southern Kenya is an ambitious project seeking to prevent 37 million tonnes of carbon dioxide (CO2) emissions in 30 years. The project area is as striking as the volcanic mountains and the Maasai tribe who have traditionally been living in the region. It was conceptualised in 2013 by seven conservation groups and two government agencies—the Kenya Forest Service and the Kenya Wildlife Service—to prevent deforestation and land degradation in Chyulu Hills National Park, part of Tsavo West National Park, Kibwezi Forest Reserve and communal grazing land of the Maasai. Project developers say the Maasai pastoralists are abandoning their traditional lifestyle to cope with frequent droughts. They are moving into the protected areas in search of greener pastures and are leasing their land to agriculturists for additional income. Following the drought of 2009, which claimed 70 per cent of the community’s livestock, several households, especially women, have taken to making charcoal by felling forests. Both charcoal making and conversion of grass- land into farmland lead to carbon emissions. So, while project developers have deployed rangers to bar Maasais from entering the protected areas, they are also showing them ways, on a pilot basis, to restore their degraded land and improve fodder production. In 2016, an indepen dent verifier certified that in three years the project had prevented 2.03 million tonnes of CO2 from being emitted into the atmosphere, and allowed it to trade as many carbon credits in the voluntary market with those who want to offset their GHG emissions. Till December 2017, the project managed to sell 19,800 credits at the rate of $12 to the American jewellery retailer, Tiffany and Co. Though the communal land of Maasais constitutes a significant part of the project area and they have to forgo their living for making the project succe ssful, the project has no mechanism to channelise the carbon revenue directly to the Maasai. The project developers claim the reven ue will be reinvested in the project, but infrastructure for forest protection, such as vehicles and equipment, top their priority list. But this will mean more restrictions for the Maasai and reinforce the controversial fortress conservation. Located further east of Chyulu Hills, this was the first REDD+ project in the world to sell carbon credits in 2011. Spanning 200,000 ha, the project area forms a corridor between Tsavo East and Tsavo West national parks and comprises mostly large ranches. The premise of the project is simple: as climate extremities increase in frequency and crop failures become rampant, almost 90 per cent of the forests in the ranches would be lost in over 30 years due to slash and burn cultivation and charcoal production by communities, mostly Taita agriculturalists, living around them. So, along with Wildlife Works Carbon (WWC), a for-profit organisation, the ranch owners have prohibited cultivation, charcoal production, poaching and bushmeat hunting in the project area and have deployed rangers to report cases of violation. WWC is also creating employment opportunities for the residents, and teaching them how to produce charcoal sustainably and improve agricultural productivity. Project developers claim that their aim is to prevent 52 million tonnes of CO2 over 30 years. As of now, the project generates 1.2-1.3 million carbon credits a year, which is sold at $5 per tonne of CO2. Initially, the ranch owners and the community received 33 per cent of the carbon revenue each, while an equal amount was kept aside to pay for the operational costs. While the ranch owners received their revenue share as cash, WWC would use the community’s share to improve water and school infrastructure and to provide bursaries (scholarships) to schoolchildren. In 2016, WWC changed the revenue-sharing mechanism. While the ranch owners continue to receive 33 per cent of the carbon revenue, WWC also takes a share now. A 2016 paper titled, Roots of inequity: how the implementation of REDD+ reinforces past injustices, says operational costs of the project account for some 53 per cent of the revenue. The remaining revenue is shared equally between WWC and the community, with the share of the latter reducing to a meagre 6 per cent. This is too little to improve the lot of the residents who are now bearing the brunt of the project. With improved forest protection, wildlife populations in the project area has increased, resulting in frequent raiding of farm lands and loss of livestock. “This year, communities have asked us to use the carbon money to address human wildlife conflict,” says Laurian Lenjo, community relations manager of WWC. But can it achieve this with a meagre share allocated to the community? In 2009, two conservation bodies—Tanzania Forest Conservation Group (TFCG) and Community Forest Conservation Network of Tanzania (MJUMITA)—partnered to implement the first REDD+ pilot project in the country, which was experiencing deforestation at an astounding rate of 1 per cent a year, largely due to agricultural expansion. The project area covers 41,924 ha of coastal forests in 10 villages in Lindi district where forests were at risk from shifting cultivation traditionally practised by the village communities. But at the outset, the project got a patron. The Norwegian government provided it $5.9 million for five years till 2014. TFCG and MJUMITA followed three key strategies to make the project work. First, they set aside a small portion of the funding as “trial REDD+ payments”. Second, all residents of the villages were treated as “shareholders” with equal rights to carbon pay- ments. Third, the project established community forest reserves with well demarcated boundaries. The villages were required to protect the forests and improve productivity of their farmland. In return, they were promised cash payments. Over the next five years, the project prevented 40,178 tonnes of CO2. In 2014, the project developers paid 199 million Tanzanian Shillings ($89,068) from the “trial fund” in cash to the communities; each household received almost $30. “Our model works because it gives the community members individual responsibilities towards conserving the forests,” says Rahima Njaidi, executive director of MJUMITA. The strategies did help improve the economic conditions of the communities, but it did not last. The project failed to sell a single carbon credit in the voluntary market. As the Norweigian funding dried up, communities could not be paid. Community leaders claim that people have not gone back to shifting cultivation, hoping that someday they would again get paid for protecting their forest. “The biggest challenge with the carbon markets lies in the fact that buying carbon is not mandatory, and therefore getting buyers for carbon is not easy,” explains Njaidi. 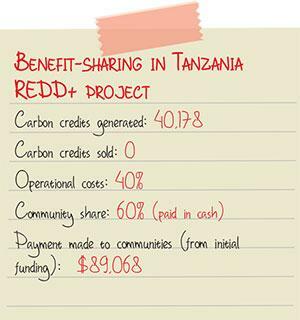 The case is similar for eight other REDD+ pilot projects in Tanzania. It is one of the few REDD+ projects driven by communities. Started in 2011, it spans 27,139 ha of biodiversity-rich land owned by 62 communities in 10 himas (village kingdoms) in Meghalaya’s Khasi Hills. It hosts sacred groves where com munity regulations ensure that primeval forests remain almost untouched. Yet, forest fires, fuel wood collection, grazing, small-scale mining of coal and other minerals, encroachment, charcoal burning and soil erosion were causes for concern. Communities then identified 9,270 ha of dense forests which they monitor to reduce incidents of forest fires. An additional 5,947 ha of degraded forests is being regenerated for fuelwood and other needs with financial support from Germany-based WeForest. 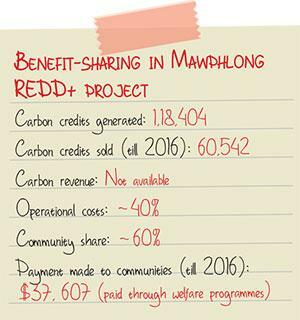 Till 2016, the project generated 118,404 carbon credits. Satellite imageries show forest loss in the project area was 2.8 per cent per annum during 2006-10, almost 50 per cent less over the previous period of 2001-05. Incidents of forest fires have also reduced. The project manages to sell most of its carbon credits, and the carbon revenue is distributed in two ways: as cash to villages for community development works like restoration of waterbodies, and in kind, such as LPGS and smokeless chulha. Mark Poffenberger, executive director of non-profit Community Forestry International that supports the project, says carbon and its price is not central to the community moti vation to protect and restore forests. “It is linked more stro ngly to people’s desire to restore the environment and the servi ces forests provide, such as springs, non-timber forest pro duce, micro-climate benefits and biodiversity,” he adds. Despite the achievements, the project faces challenges as some from the communities have started buying charcoal from outside the project area to meet their fuel needs. This defeats the efforts to reduce overall deforestation and emissions. Has REDD+ turned into a dead cause? By ensuring carbon sequestration as well as biodiversity conservation and sustainable forest management, REDD+ was meant to provide a win-win deal. But implementation experiences show there are trade-offs involved. First, the carbon prices are too low. On an average 33 per cent of the carbon revenue earned goes into meeting the operational costs, which involves costs of measuring, verifying and marketing carbon credits. As a result, communities’ share of carbon revenue reduces significantly. This casts a serious doubt on the ability of REDD+ to compensate the opportunity costs to give up deforestation. 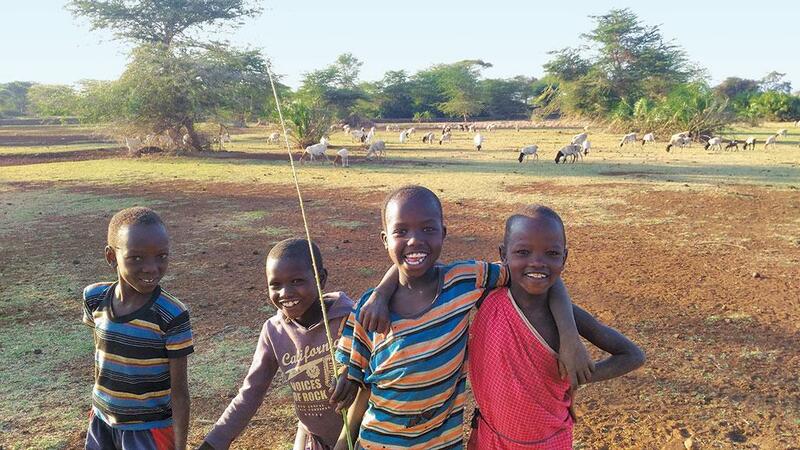 In Chyulu Hills project, say local people, the Maasai earn up to 60,000 Kenyan shillings ($600) a year from leasing a hectare of grazing land for agriculture. The project helps reduce 3.3 tonnes of CO2 per ha per year. Even if all the carbon credits were sold at $12 per tonne—the average price is close to $4.5 per tonne in the voluntary carbon market—the carbon revenue will not exceed $40 per ha per year. Now do the math! Similarly, in Khasi Hills, the carbon price would have to be $45 a tonne if fuelwood were to be substituted with LPG, shows CSE’s analysis. The price has been low outside the voluntary market as well. For instance, the World Bank has signed emissions reduction purchase agreements with a number of countries in the Congo Basin for large-scale REDD+ programmes, spanning a province or a landscape. Under the agreements, countries will achieve emission reductions over 20 years and the Bank would buy a pre-specified volume of the carbon credits at $5 per tonne. The quantum of global finance for REDD+ has also been extremely poor. A study by Washington DC-based Centre for Global Development shows that global pledges for REDD+ initiatives averaged just $796 million annually since 2010, largely from government sources. This compares poorly to the annual requirement of $5 billion predicted by the Stern report. “The private sector was expected to provide much of the finance for REDD+, but where are they?” asks Kill. Little wonder that there is no convincing evidence to establish reversal in global deforestation trends, even after more than 10 years of REDD+ existence. Some experts, however, say it is too early to dismiss the mechanism. “We have to dig deeper to understand what works and what doesn’t in policies aimed at reducing land-based emissions,” says Christopher Martius of Indonesia-based Centre for International Forestry Research. In terms of finance too, new pledges have been made. At the start of COP21 in Paris, the governments of Norway, Germany and the UK collectively committed another $5 billion for REDD+ over the next five years. “Governments could also do a lot more to incentivise the private sector to finance REDD+ efforts”, says Chris Stephenson of UK-based Plan Vivo Foundation. The clock is ticking, and a lot of issues need to be addressed. “We need a REDD+ mechanism that meets the opportunity costs without selling our forests cheap and enables sustainable forest management without re-centralising forest governance and compromising community rights,” says Chandra Bhushan of CSE. One general question that kept churning in my head as I read this article by my friends Shruti Agrawal and Soujanya Shrivastava, which sets the context of this rebuttal, was: without detailed surveys, what was the purpose of article and who were its intended audience. How does this article help a local community person in Kasigau? If the idea is to work out what is a fair payment to the community, why wasn’t more effort taken to undertake community surveys, understand their use of the resources in the ranches, and compute actual opportunity costs. And crucially, doing this at the ‘community’ level and NOT simply extrapolating based on a few individuals undertaking charcoal production and poaching, albeit illegal, in these Kasigau communities? Below are several statements in the article that we feel are misrepresentations of the Kenyan REDD+ projects described in the article. To make it easier for the readers, I re-state the statement then follow it up with a response. 1. But the fundamental fear is that to achieve its environmental objective, REDD+ will impose restrictions on communities who depend on forests, especially those with insecure land tenure, and encourage evictions from forests. There are also doubts whether the mechanism, elaborated in just two paragraphs in Article 5 of the Agreement, would adequately compensate these communities for forgoing deforestation, which they rely on for subsistence and livelihood earning. Romantic notion: Admittedly, some REDD+ payments might be less than immediate destruction to specific community members engaging in deforestation or commercial poaching, but this is both as short-sighted as it is unsustainable to imply that entire communities undertake these activities and would thus suffer uniformly. Besides, the authors should also take it a step further and explain what happens then when the communities run out of trees to earn their living, given forests are finite resources. 2. As the implementation of REDD+ graduates from small projects to large-scale programmes, the mechanism has moved the goalposts and the opportunity costs have stopped appearing in REDD+ discussions. Jutta Kill, a Berlin-based researcher, says REDD+ is now looked upon as a mechanism to address the drivers of deforestation and forest degradation, instead of compensating for opportunity costs. Incorrect: This demonstrates a lack of knowledge about land use and tenure, opportunity costs and perverse incentives in project implementation. 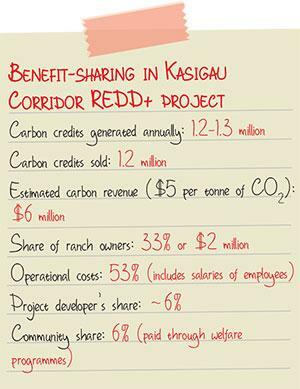 For the Kasigau Corridor REDD+ Project (KCRP), payment to landowners is a direct form of opportunity cost compensation as they are the ones who sign the Conservation Easements and have legally-binding restrictions on use of their land. Here, as a matter of law, the community members who are not legal landowners are not legally allowed to exploit resources on ranches, much like a homeless person wouldn’t just walk into Walmart and grab a shirt and walk out. There are community members who are as poor and struggling as much who choose not to engage in these illegal activities. ‘Rewarding’ those that do sends a poor message about fairness and can be a perverse signal for the others to also engage in similar activities. 3. Though the communal land of Maasais constitutes a significant part of the project area and they have to forgo their living for making the project successful, the project has no mechanism to channelise the carbon revenue directly to the Maasai. The project developers claim the revenue will be reinvested in the project, but infrastructure for forest protection, such as vehicles and equipment, top their priority list. But this will mean more restrictions for the Maasai and reinforce the controversial fortress conservation. Again, incorrect and simplistic: very few Maasai directly exploit the resources restricted through the Chyulu Hills REDD+ Project (CHRP), namely charcoal production, but potentially more stand to benefit from the environmental stewardship and development programmes under REDD+. No Maasai is denied the right to graze their own livestock on any of the REDD+ project ranches; grazing is National Parks in Kenya is not allowed anyway, with or without the REDD+ project. They are encouraged not to lease out their ranches for grazing because of the abuse that comes with these leases leading to massive overgrazing and conflicts with both wildlife and the Masaai’s own livestock. They are also encouraged and facilitated (through an alternative income stream) not to subdivide their farms and lease them for farming, both because farming is not the most suitable activity in this water scarce area, and also such that they are able to preserve their grazing grounds which sustain their traditional pastoralist lifestyle. This is an article based on a brief two-day visit to our REDD+ project sites by one of the authors. It is not based on any real or published research; it is mostly opinion and innuendo aimed at discrediting these REDD+ projects. I write this short response because I felt it not only misrepresents the feelings of most of my fellow community members about the REDD+ project, but also because I fear such articles could harm our communities by painting a negative picture. How do I know? Because I am the Community Outreach Officer for the Wildlife Works Kasigau Corridor REDD+ Project (KCRP), so I spend all day every day with the communities who are benefitting from the project. I am the one who Ms. Agarwal quotes out of context in her article. I was born in this community and have worked with this project since its very beginning 20 years ago. As such, I present here my own experiences, as well as those of my fellow community members, which is backed by the data we produce every year. When we see articles like this, we ask ourselves: what is their real purpose? There is a lot of talk of the community, but how does this article help a local community person in Kasigau? How did these authors determine what the community wants, what is has as alternatives and what its wishes are? No one has been evicted from the forest because of the KCRP or the Chyulu Hills REDD+ Project (CHRP) which I am very familiar with and passionate about because of the role my company, including myself, played in assisting the local communities there to implement that project. The landowners of both the KCRP and CHRP are members of the local communities themselves. So, when the authors imply that it is WWC or conservation groups or the government that own the CHRP, they fail to mention the critical fact that the Maasai group ranches are owned collectively by the Maasai pastoralists themselves. WWC and the conservation NGOs formed an innovative Public-Private-Partnership (PPP) with the government and the Maasai Landowners in the form of a trust, to assist in the development and management of the REDD+ project. The government is involved because the project also includes Chyulu Hills National Park, which was created decades before the REDD+ project. I am not sure if cattle are allowed in National Parks in India where Ms. Agarwal is from but they certainly are not in Kenya. The Maasai get benefits from the CHRP in terms of education and healthcare without giving up any of their traditional grazing rights to their land. Cattle is how Maasai support their livelihoods and culture, not charcoal production or even farming as incorrectly suggested by the authors. On opportunity costs, communities in both the KCRP and CHRP had to weigh whether, in the long-run and to the majority of community members, the project benefits were greater than costs before they could accept the project. In my experience, REDD+ projects that do not have community support simply do not happen. How could they? Communities own the land. They collectively decide on its use. In the KCRP, there are 120,000 of us. How would the project deny us rights to our resources without our consent? How can you insinuate that the rights of a handful of illegal charcoal burners or elephant poachers are to be valued above the wellbeing of 120,000 law-abiding community members, the vast majority who value this project greatly for all the benefits it has provided across the entire community? WWC employs over 300 of my fellow community members in the KCRP, and in total ploughs over 70% of the project revenues back into the community from paying salaries and landowners, to financing communal projects and various services provided by community members. I know this because we produce accounts based on actual data to demonstrate our benefits to the community. On multiple occasions, my colleague and I stressed to Ms. Agarwal that the notion that the communities receive “a meagre 6%” was grossly inaccurate because she was only considering the profit-share allocation to the community, which is only one element of the communities’ total compensation from the project and excludes community landowners, employees etc. Yet, inexplicably, she went ahead and published the same misleading information. Furthermore, another reason the profit-share allotment was so low was that sales were especially low in the year she chose, which can – and will – change in future as sales improve. She also fails to acknowledge that the millions of dollars that have come into my community over the last 8 years from the REDD+ project have dramatically changed our situation for the good. And now to my quote that the author used out of context. She quotes me as saying that “This year communities have asked us to use the carbon money to address human wildlife conflict”. She not only neglects to say that this is in addition to their annual spending on education, water projects and healthcare, but also that the spending of the profit-share allocation is self-determined by the communities themselves through elected committees. She paints a picture of increasing human-wildlife conflicts supposedly from increasing wildlife due to the REDD+ project, and fails to see or disclose the other side of the coin whereby conflicts have always been part of this ecosystem because it is a wildlife corridor. They were probably worse before the REDD+ project even with less wildlife, because there were neither efforts to improve habitats within the project area nor community rangers to assist the community in protecting their farmlands. So again, what was the purpose of this article, I ask myself over and over. Are we being used as pawns in some larger international scheme that does not concern us? Whatever the reason, we do not think it is fair or right that articles like this that allegedly speak for us could in fact be doing us a lot of damage for reasons we do not understand. For this reason, I warmly welcome Ms. Agarwal back to Kenya and to our communities to hear more about the project from their own mouths, so as to represent their feelings, fears and wishes more accurately in the future.